1. Players must claim and receive their bonus before they start playing with their initial deposit. 2. 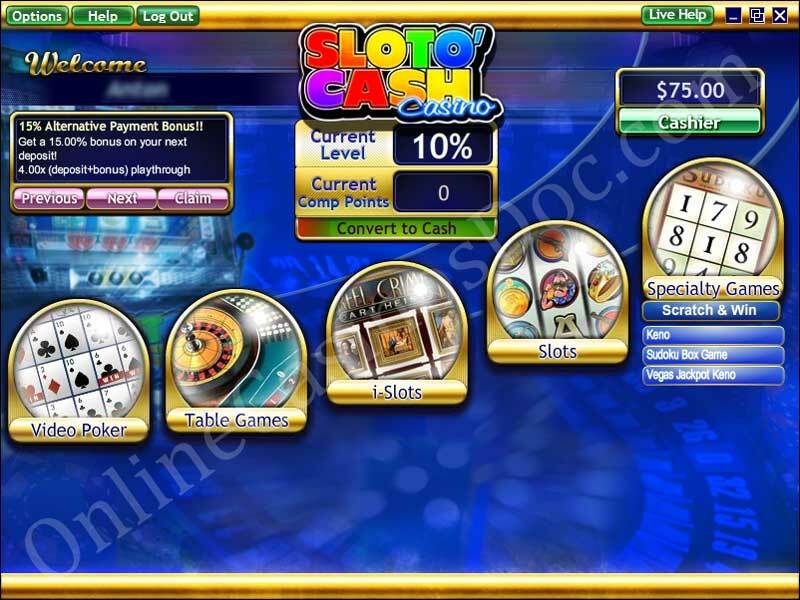 Bonuses will be credited to the Player's Real Account as Casino Credits only, unless otherwise stated. 3. The bonus must be wagered at least 15 times bonus plus deposit before withdrawing. This bonus can only be used for play on qualifying games, including 3 Reel Slots, I-slots, Video Slots, Sloto, Keno and Scratch card games only. If a player is found to use a "SLOTS ONLY" bonus to play any other game (other than the qualifying games stated) before completing the wagering requirements the casino reserves the right to void all winnings. 1. 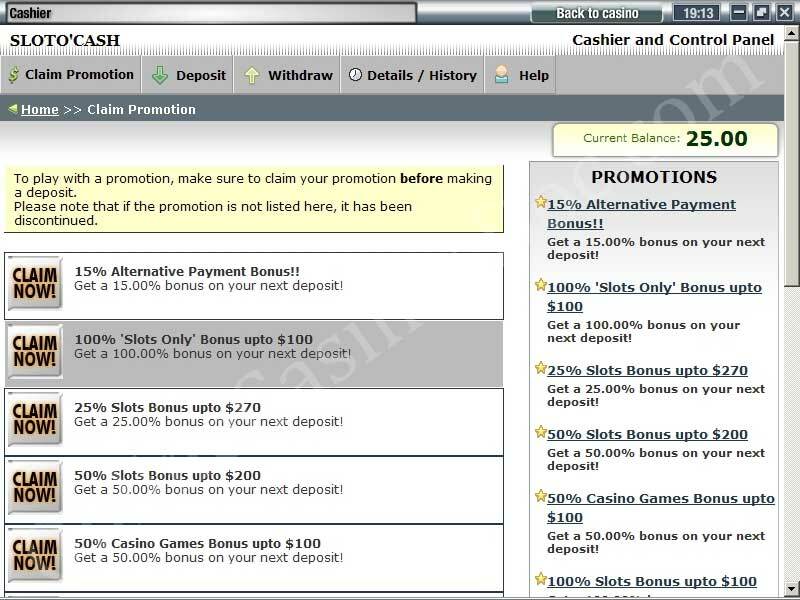 To play with a signup or existing user promotion, make sure to claim your promotion before making a deposit. 2. Wagering requirements on the 'Casino Games' welcome bonus are 33x the deposit and bonus before any cash-outs will be permitted. All types of Blackjack, Craps, both American & European Roulette, DoubleUp, Slot Progressive and Baccarat are excluded. If you wager on these games, your winnings will be void but the original deposit returned. $7 FREE No Deposit Bonus: Free Bonus received with no previous deposits required. 1. Any winnings made from this bonus money can be redeemed if the amount of the cash out is above $50.00 USD but doesn't exceed $150. 2. Withdrawals from free bonus promotions of $50 to $150 are only processed when a copy of a utility bill is received, matching the address registered on your slotocash account. 3. The entire bonus amount must be played before requesting a withdrawal. 4. To be able to withdraw funds from free money players need to wager 12 times the amount of the bonus received (if you receive a free $7 sign up bonus, you must wager $84 before you are able to cash out any winnings). Playing Roulette, Craps, Baccarat, Video Pokers and any type of Blackjack games is restricted. If you wager on these games, your winnings will be void but the original deposit returned. 1. 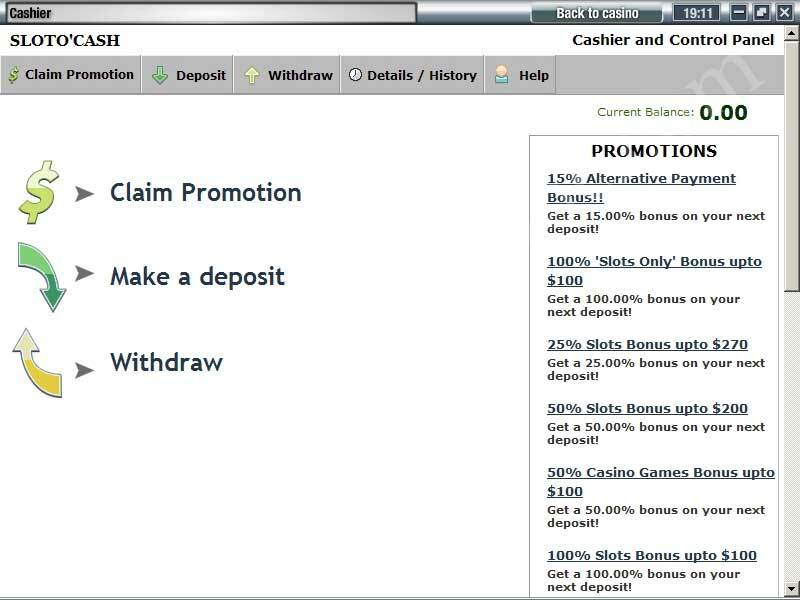 Simply sign up a real account today and visit the casino Cashier. 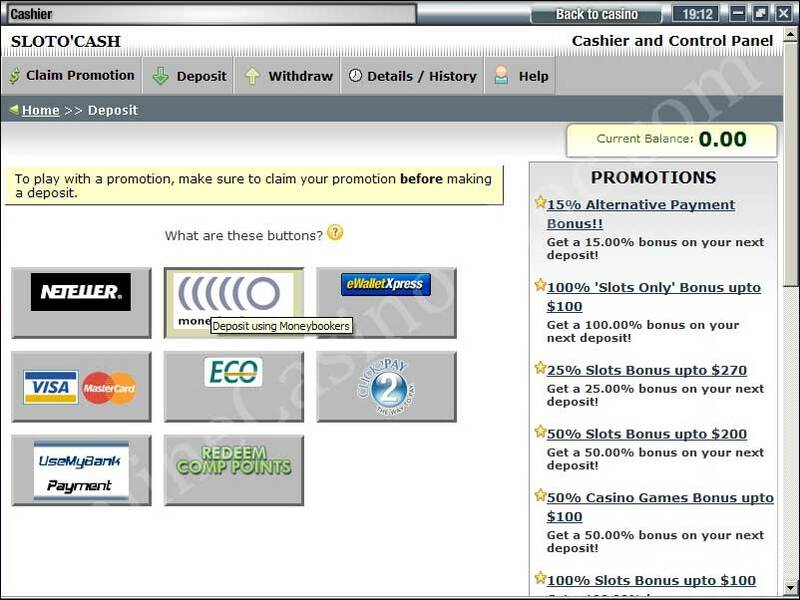 15% Alternative Payment Bonus if you use Neteller, ewalletExpress, 900pay, EcoCard, Click2Pay, Moneybookers, UseMyBank. 1. Cannot be claimed in conjunction with any other bonus offers. 2. Wagering requirements on the 15% extra payment bonus are 4x the deposit and bonus before any cash-outs will be permitted. Craps, both American & European Roulette and Baccarat are excluded. If you wager on these games, your winnings will be void but the original deposit returned. Every time you wager at Sloto'Cash Casino you earn Sloto Points - Sloto Points convert into real money & extra free spins. For every $1 you wager, you will earn a specific amount of Sloto Points depending on the game you have chosen and your VIP Status. When you reach 1000 comp points you can convert your Sloto Points to real money! 1000 comp points translates into $1 real money. For every friend you refer to the casino the casino will credit your account with $25 FREE Bonus. There is no limit to the amount of bonuses you can receive. 1. 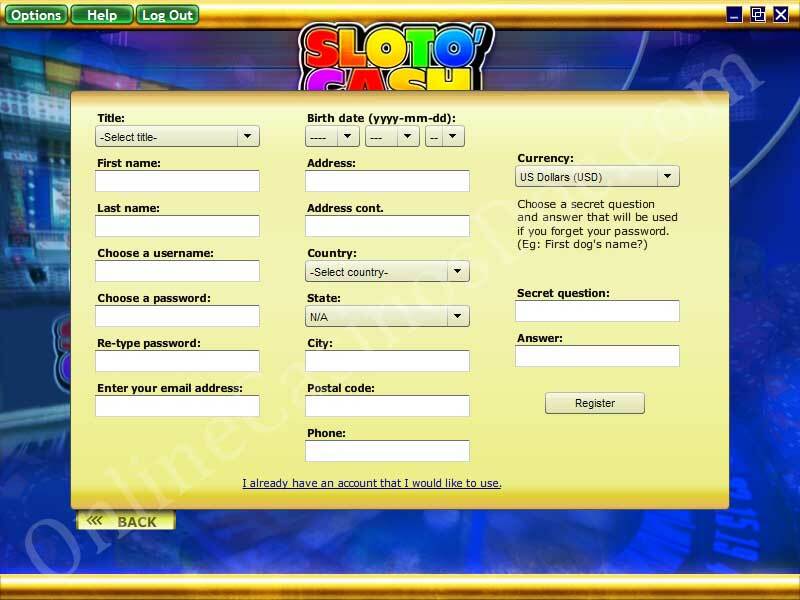 In order to refer a friend you must be an active member of Sloto'Cash Casino. 2. You can refer as many friends as you want, as often as you want. 3. To cash out this bonus, you must wager the bonus 15 times. 1. To Refer-A-Friend visit the casino cashier and click the Refer A Friend tab on your right. 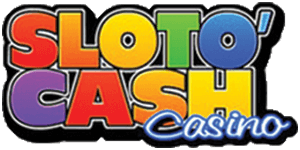 If you want to claim any of the bonuses offered above, you need to register a personal account at Sloto'Cash Casino. You can do this through downloaded version of the casino. Note that you have to choose to play for Real Money but if you have a Fun account, it'll work and you won't have to provide additional info or create another account. 1. 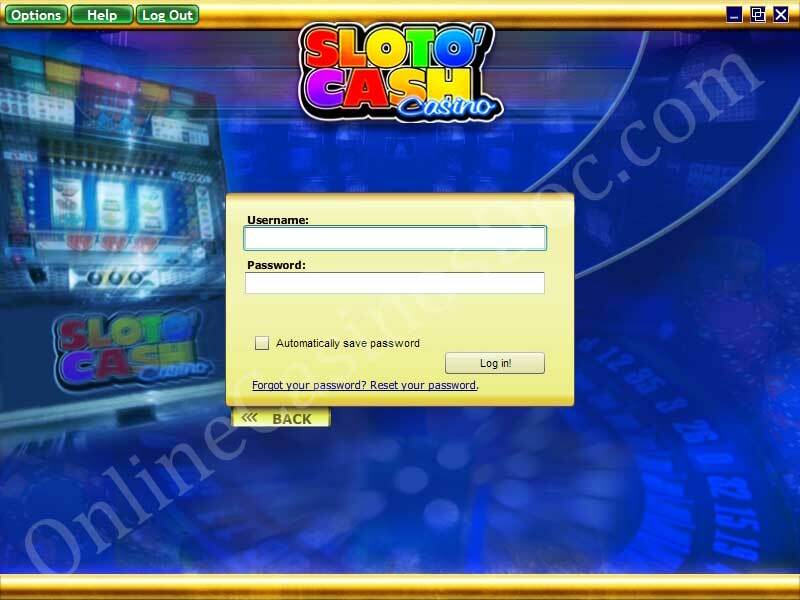 Having registered an account, you need to Log in and enter your account name and password assigned to you after the registration and choose to play for Real Money. 2. Go to Cashier and choose the bonus you would like to be credited with BEFORE you make a deposit clicking Claim Promotion. When you choose the bonus promotion that you find attractive, click it and you will see the conditions applied, the deposit methods that qualify and the games restricted. Push 'Claim this promotion' button above the bonus you have chosen. 3. Choose the payment method to make a deposit. Follow the procedure laid out. After the notification that the deposit was successful, you will be credited your bonus automatically. 4. You can see the amount of money on your casino account in the box above the Cashier button. The account is common for your deposit and bonus money.